Last year I audited two courses on World History from two American Universities. The first one was the Making of Modern World from the University of California, San Diego (UCSD) and the second, The Modern World: Global History since 1760 from Princeton University via Coursera. A common area covered in both the courses were the Islamic invasions of India and the establishment of the Delhi Sultanate. The UCSD course by Prof. Matthew Herbst, spent almost an hour on the topic, while that much time was not spent by Prof. Jeremy Adelman of Princeton. While the UCSD lectures are still available online, the Princeton ones have gone offline and so the I have to rely on the course textbook for material. In this post, we will look at how the two professors dealt with the material. The book Worlds Together, Worlds Apart: A History of the World: From 1000 CE to the Present (Third Edition) by Robert Tignor et al, which is the course textbook at Princeton, talks about this period and states that Islam joined the canopy of Hinduism to make the region more diverse. This showed how cross-cultural integration preserved diversity as well as integral unity. As the Turks “spilled into” India with their new beliefs, they added to the ethnic and religious mix “without upsetting the balance” and India became an intersection of trade, migration and culture of Afro-Eurasian people. How did India look during that period? They were ruled by Rajas, supported by high-caste Brahmins. These Brahmins previously had converted much of uncultivated India into arable land. The Brahmins also did two other things: they built temples and converted indigenous hunter-gatherers to Hinduism. Following that they spread the religion and expanded the agrarian tax base. The relationship between the Raja and the Brahmin was one of quid pro quo. The Brahmins created elaborate genealogies for the kings and the kings besides giving them wealth learned Sanskrit culture and became patrons of arts. When the Turkish warlords entered India, they introduced their own customs while accepting Indian customs like the caste system. Since they were concerned with promoting their religion, they built grand mosques and libraries. There is mention of both Mahmud of Ghazna and Muhammad Ghuri: the former just led some “expeditions” into North India while the latter led a wave of “invasions.” Much later, when the Delhi Sultanate was established, they strengthened the cultural diversity and tolerance, which were the hallmarks of Indian society. They did not convert their subjects and due to this India never became an Islamic-dominate country. Also, by the time the Turks arrived, India had experienced many invaders and had assimilated them. The Turks cooperated with the assimilation and thought of themselves as Indians, but they never changed the way they dressed and soon the local started wearing trousers and robes. They had an influence on the language as well: Persian was made the court and administrative language even though the majority of the people they ruled did not speak that language. According to the authors, Islam did not become a conquering religion in India; they collected jaziya and let people worship as they pleased. The new sultans granted land to the ulema and Sufi saints, like how the Hindu rajas had done to Brahmins. 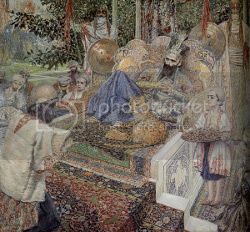 Ferdowsi reads the poem, the Shahnameh, to Mahmud of Ghazni. Prof. Herbst sets the context by talking about the Egyptian Mamluks, who were Central Asian pagans who were captured, sold, converted and eventually ruled Egypt as elites. They were Muslim rulers who were ruling over a Muslim population and even though they were outsiders in terms of language and culture, they were insiders in terms of religion. These outsiders united the people by advocating jihad against the enemies of Islam like the Mongols, Crusaders and Shiites. But when it came to the Delhi Sultanate, they had a different problem: they were a Muslim power ruling a numerically large non-Muslim population with a radically different culture. He explains the three approaches of Islam in India during this period. The first was to plunder and leave. According to Prof. Herbst, Mahmud of Ghazni did not lead “expeditions”; this descendent of a Mamluk, led military campaigns for plunder. He attacked cities, sacked temples and wanted to destroy the idolaters of India. The Somnath temple was destroyed and the idols of Shiva were broken and there were two reasons for it. One, the temples had money and it was simple plunder. Second, Hindu temples have representation of God and that if offensive to the invaders because that is forbidden in their religion. Mahmud called it jihad and the Caliph from Baghdad wrote a letter congratulating him for a quarter of century of attacks. The second approach was to conquer and stay which the Delhi Sultanate did from the 13th to the 16th century. Their goal was to change India from Dar al-Harb to Dar al-Islam and that was a hard task in a land which was holy to another religion. Also the Delhi Sultans were outsiders who ate different food, spoke a different language and had a different style of clothing. The Caliph appreciated the work of the Sultans, but then Indians did not care much for the Caliph. They adopted Persian as the language of the court, but a vast majority of Indians did not speak that language. To build legitimacy in such an atmosphere, they did few things. They built the Qutub complex using the pillars of destroyed Hindu and Jain temples. Then they also bought the iron pillar and some Asoka edicts there. Then a 240 ft high minar was built. Obviously such a tall minaret was not for the muezzin to call the faithful for prayer, but it was a statement of power to the 100 million non-Muslims. Even though India lay at the geographic fringe of Dar al-Islam, they had to be central in their accomplishments. For this they hired Muslim poets and judges: Ibn Battuta, a North African Muslim, thus found a job a qadi in Delhi and Muslim scholarship and literature started rising from India. The third approach was the Sufi way. The Sufis, who emphasized a person experience with God and used images of sexuality and drunkenness, challenged the tolerance of the ulema. They were organized into brotherhoods under a sheikh. They ran soup kitchens, asked the followers to develop river like generosity and enjoy worldly pleasures in moderation. They did not want to be seen associated with the administration: there is a story of one of the sheiks leaving through the backdoor when the Sultan visited. When the Sufi sheikhs died, their shrines became places of pilgrimage and very soon there were Muslim places of pilgrimage in a place where there was none. Prof. Herbst ends by talking about Vijayanagara empire, which was established in South India during this period to ward off the Islamic invasions. The Princeton version has no mention of the plunder or the destruction of temples; they are replaced with euphemisms like “expeditions” or “spilled into” as if they came on a sightseeing trip. Also, in their versions empires like the Mauryas and Guptas which ruled a large portion of India did not exist and it was left to the Brahmins to make the whole country arable. That must have been quite an effort. The UCSD version does not resort to such political correctness. These two interpretations shows how Indian history is shaped and massaged in American Universities. Sometimes you know the historian and are prepared for the bias. When it comes to unknown historians, it is important to read multiple interpretations to understand the history of the historian. Why is there no Indian (Hindu) version of the history and/or rebutted the versions of European and Islamic historians. I wish I knew of such an individual or organization willing to write such a version. There are many Indian versions of History of India, if you ignore what the Anglo-Americans write. There are multi-volume series on the history of India by Ramesh Chandra Mazumdar. There is no need to write anything written by the Anglo-Americans. Do the British read history of England written by the Chinese?? I would not be surprised if there’s a Chair at Princeton funded by Saudi money. That’s how Islamic history is white-washed in the academia. Here he heard that in Brahmastpuri there was a golden idol, round which many elephants were stabled. The Malik started on a night expedition against this place, and in the morning seized no less man two hundred and fifty elephants. 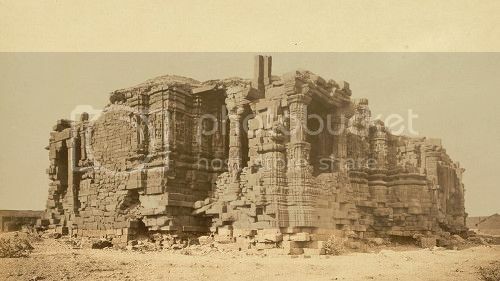 He then determined on razing the beautiful temple to the ground, –You might say that it was the Paradise of Shaddad, which, after being lost, those hellites had found, and that it was the golden Lanka of Ram. The roof was covered with rubies and emeralds,-in short, it was the holy place of the Hindus, which the Malik dug up from its foundations with the greatest care, and the heads of the Brahmans and idolaters danced from their necks and fell to me ground at their feet, and blood flowed in torrents. Every ******* time I come across the truth in Indian history and the versions I read from the other side, I am struck by awe and surprise. I don’t understand what makes Truth so bitter that people like to live a lie ?